Meet the Beatles for Real: Give her a Break, Paul! Give her a Break, Paul! This is an article from a London newspaper published on April 5, 1970. 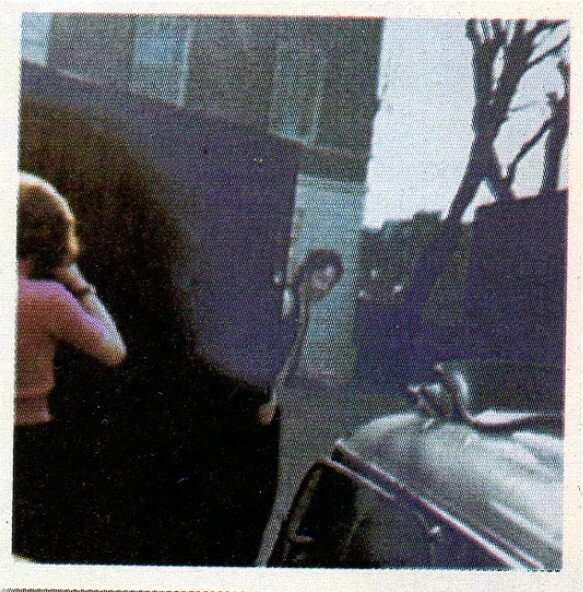 I found it in the July 1970 issue of "Beatles Rule!" newsletter. It was written by Peter Oakes. Gone are the shrieking hordes of delirious girls. Gone are the straining police cordons outside besieged theatres., but Beatlemania is still with us. It's there, with all its unswerving adoration, outside a 40,000-pound house in St. John's Wood, London, home of Beatle Paul McCartney. Come rain, hail, or shine, dozens of teenage girls, maintain a hopeful vigil outside the black double doors of No. 7 Cavendish Avenue. Day in, day out. All for a glimpse of their idol, and perhaps (just imagine) a friendly word from the star himself. The most devoted fan of the McCartney flock must surely be 23-year-old American Carolyne Mitchell. She arrived in Britan 13 months ago and since then hasn't missed one day outside the hallowed McCartney home. Carolyne, who works in a private nursing home, explains it simply: "I care for Paul. I care for him deeply. I'd like to be in there with him. I'd be with Paul and I'd be happy." There is, of course, a snag to that little idea. Paul has a wife, Linda. And what a sore spot that is for his worshippers on the doorstep. To them, Linda is a great obstacle between them and their hero and what they say about her is enough to make an old style Beatle mop curl. In his bachelor days, Paul would talk to the fans outside over the house intercom system. Of even go outside for a chat and to pose for photographs with them. Those were the good old days. Now they don't' see very much of Paul, sometimes not at all for weeks on end. What wife, after all, wants her husband to chat with a bunch of strange girls outside? But still, fans wait. And wait. And hope. From time to time, police move them on, but in no time at all, they are back. It really is all very frustrating and annoying for everybody, at least Paul's neighbours. Mrs. Evelyn Grumi, who lives opposite, with her husband and two children, said, "The girls sit on our wall. I wouldn't mind if they just sat, but they play their transistors very loudly and shriek and giggle and shout. If you try to talk to them reasonably, they just hurl abuse language at you." The McCartneys have complained to the police about the girls standing outside causing a nuisance. Matters did come to a head on the night off Paul's first wedding anniversary. One group of girls celebrated the occasion by spreading confetti and pushing a bunch of flowers through the gate. Another group banged dustbins and barricaded the McCartney drive with milk bottles -- with the result that three of them ended up in court for insulting behavior. The fans have been in divided camps ever since. The confetti crowd have since transferred their adulation to the headquarters of Apple. They even produce a duplicated "magazine" which has recorded the girls conclusion that Paul was stolen from the fans by his wife. Another issue has a lost and found column. In the lost section was the time" "Beatle Paul -- last seen March 12, 1969." Sally and Christine are in this group. Both are 20 -- left their homes in the provinces to come to London to be near their idols. Christine said, "I met Sally outside Paul's house and stayed with her. My parents were a bit upset but they accepted it. I was without a job for six weeks and spent the whole of the time following Paul and the Beatles around." Sally described those traumatic days after Paul's marriage, "When he first brought Linda back, we would all stand in a row and scream abuse at her." She also recalled an incident while Paul was on honeymoon. A lot of girls, many of them Americans, broke into Paul's house and stole all his photographs. he used to leave his windows open and girls were always climbing in and out. On his wedding day, Paul's mail was also intercepted by the ever watchful fans. The letterbox is easy to get into. They took out the telegrams and read them. But they put them right back after they had read them. Now, four houses in Cavendish Avenue are empty, and display signs declaring "Sold" or "for sale" or "acquired." Neighbours have even held informal meetings to try to work out a plan of campaign to get rid of the troublemaking fans. Perhaps the answer lies with Paul himself. For persistent fans -- the followers who made him an idol -- are an inescapable fact of Beatle life. Perhaps he can spare a few minutes to chat with Carolyne. What a break after 13 months of waiting. He's obviously the only person in the world the fans will listen to. Very disturbing...this is the same kind of obsession that breeds a Chapman or an Abram. Also very sad that Paul lost valuable photos, films, and recordings from "harmless" fans. Strange that these women were in their twenties yet still behaving like immature 16-year-olds. I wonder if the media exaggerated to get a story though. Dozens waiting outside day in, day out? In 1970, Paul spent months on end up in Scotland, the year of his depression. Seems like a last gasp effort from a few of his looney fans before reality hit. This was a newspaper article written by a journalist published in a fan magazine, not a "fan" story as such. I would say most of these people drifted away by 1971/72. Paul is partly to blame for all of this - he should have established firm boundaries right from the start. He was a grown man and his fans were impressionable young girls. Young girls as in the 13-16 year olds at the beginning of the Beatles career. Through teen mags and the like, some of these fans grew up fantasising that Paul was always going to be available to them, married or not. Paul should have kept his distance. Isn't that Carolyn the same nutter who stalked Paul up in Scotland too and accused him of punching her in the nose when he told her to leave him alone? Vaguely remember this on the news as quite a mess. Carolyne, who works in a private nursing home, explains it simply: "I care for Paul. I care for him deeply. I'd like to be in there with him. I'd be with Paul and I'd be happy." -Yes, but would PAUL be happy? I have a feeling he'd be performing "HELP!" from the bathroom window.